After the “big” decisions are made in legislatures and executive offices, what is done by those who implement and operate social service programs will determine their success or failure. Yet, over and over again, the managers of public organization disregard or handle poorly the critical problems involved in starting and developing new programs or in modifying existing ones. 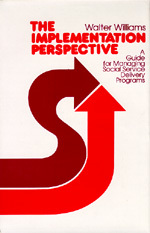 This book presents a new decision-making rationale-the implementation perspective-as the basic guide to social service program management. The cardinal principle is that the central focus of policy must be at the point of service delivery. Here is where management must redirect its attention. The demand is to concentrate on the hard, dirty, time-consuming work of building the local delivery capacity needed to provide better social services and to implement new program decisions over time. The Implementation Perspective is a message for our times. Even those who would continue the nation's effort to meet its social obligations are finding that simply calling for big new programs and more spending is no longer satisfying. Moreover, Proposition 13, the balanced budget movement, inflation, and compelling demands for new funds in such areas as energy, now squeeze social programs. New directions may have to come, not from new funds, but from rethinking and redirection and, more to the point, the better management of existing programs.